There are cursive forms of IPA symbols, but it is doubtful if these are much in use today. They may have been of greater use when transcription by hand was the only way of recording speech, and so speed was essential. The cursive forms are harder for most people to decipher, and it is preferable to use handwritten versions which closely copy the printed form of the symbols. The cursive forms of the IPA presented in the 1912 edition of The principles of the International Phonetic Association. Two of these letters are obsolete: ⟨ǥ⟩ is now ⟨ɣ⟩, and ⟨ꜰ⟩ is now ⟨ɸ⟩. 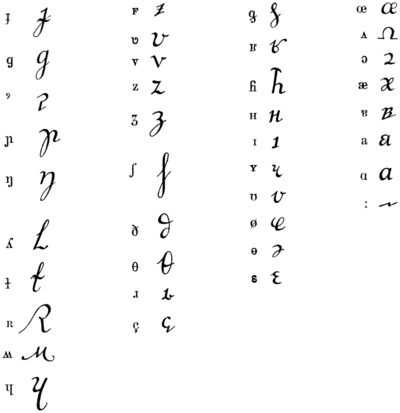 The cursive forms of the IPA presented in the 1949 edition. Hover over the image to see modern printed letters. Click on any letter for a link to the corresponding article. wəz ɔ′blaidʒd tu kon′fɛs ðət ðə sʌn wəz ðə strɔŋɡəɹ əv ðə tuː. was obliged to confess that the Sun was the stronger of the two. ^ International Phonetic Association (1999). Handbook of the International Phonetic Association: A Guide to the Use of the International Phonetic Alphabet. Cambridge University Press. p. 31. ISBN 978-0-52163751-0. This page was last edited on 28 January 2019, at 14:47 (UTC).